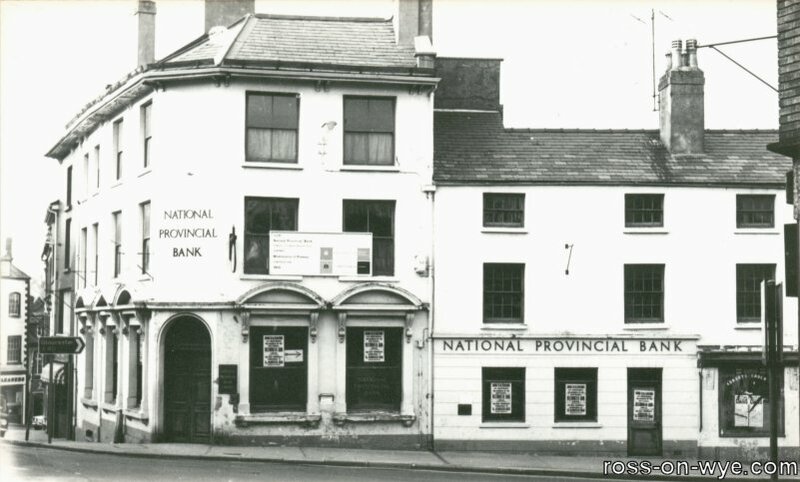 In 1970 the National Provincial Bank in Ross, which later became the Natwest Bank, was modernised. 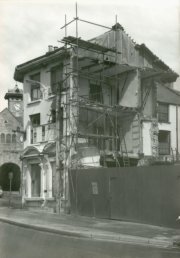 This involved the demolishion of the east side of the building as can be seen in the photos below. 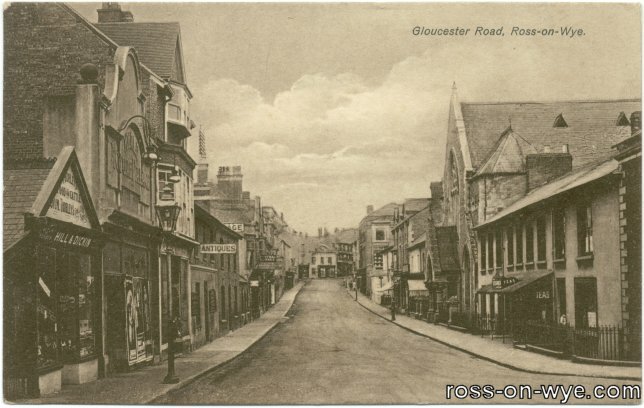 This view of Gloucester Road is incorrectly titled "High Street. Ross-on-Wye". 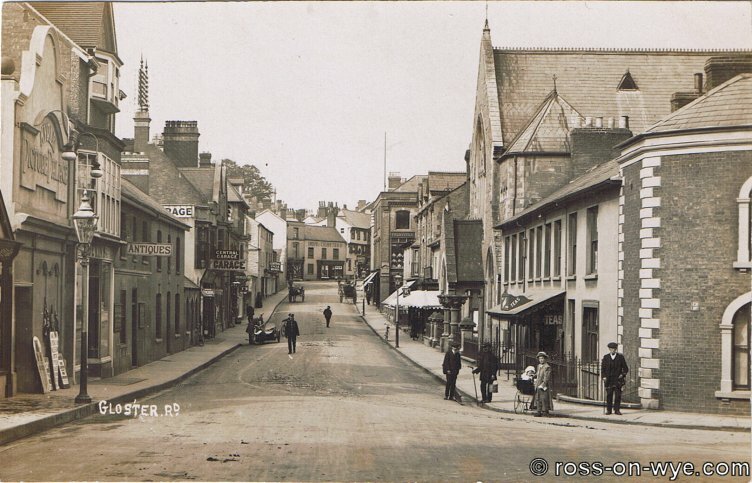 On the far left can be seen Dolly Dekin's shop which was an Antique Shop selling mostly furniture. 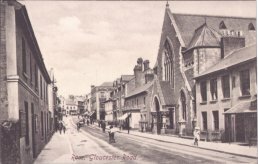 They also had the shop in the middle of the shot (the one which is now Parker's). 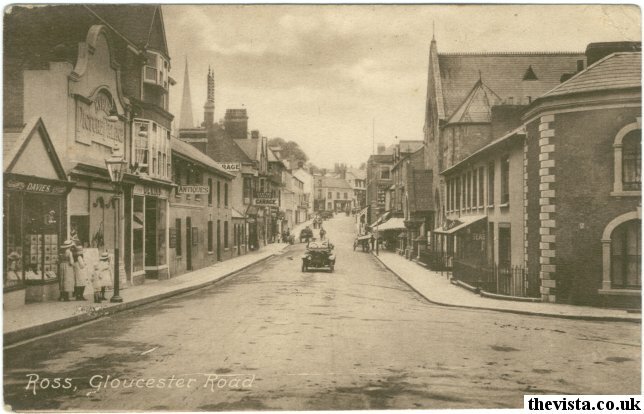 This postcard view of Gloucester Road shows that the left side of the road looks relatively undeveloped and there are no signs on the walls of the shop next to Kyrle House on the High Street (in the distance in the centre of the shot), and this dates the view to around 1916. 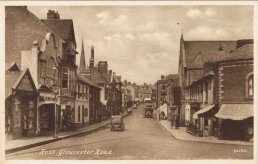 This view of Gloucester Road (published by Frith and Co. Ltd - no. 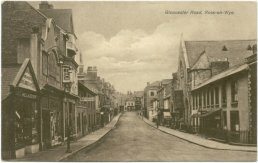 67703) was taken from the junction with Cantilupe Road in the early 1900's and the differences in the road are quite marked. 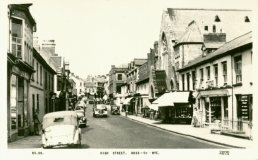 To the left can be seen R E Davis shop/studio (before he moved opposite the GPO), the Kyrle Picture Palace and Dekins shop and a bit further down, after the antiques shop, is the Central Garage next to the GPO (General Post Office) and in the distance on the left of the cross is the end of the George Hotel, where George Place is now. This view of Gloucester Road clearly shows Hill & Dickin and the Kyrle Picture Palace on the left, with the Central Garage slightly further up and the Cafe on the opposite side. In this view, on the left can just be seen the Kyrle Picture Palace. 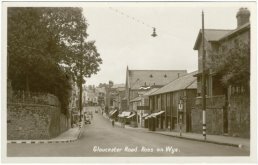 On the opposite side of Gloucester Road is W.H.Crocker, Furnisher and the Cosy Cafe, which are on either side of Cantilupe Road. 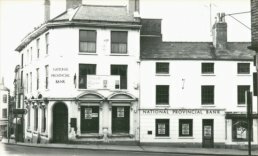 On the right hand side of the road can be seen the signs saying "NO WAITING on ODD days of the month" and on the left there is a sign saying "NO WAITING on EVEN days of the month". 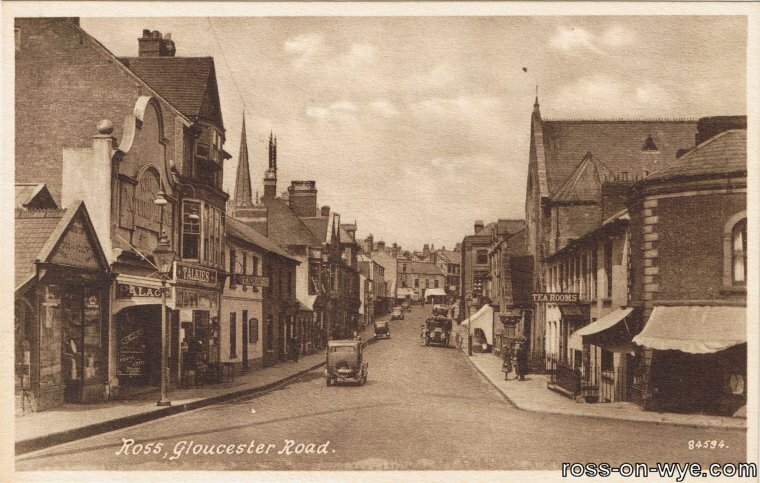 This was because at this time parking was allowed on alternate sides of Gloucester Road depending on whether it was an odd or even day of the month. 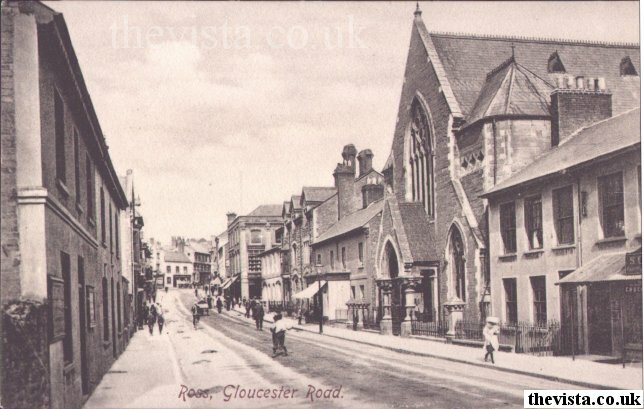 This very clear shot of Gloster Road dates from the early 1900s. 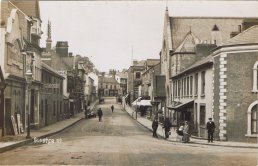 On the left can be seen the Kyrle Picture Palace and Dekins Shop. 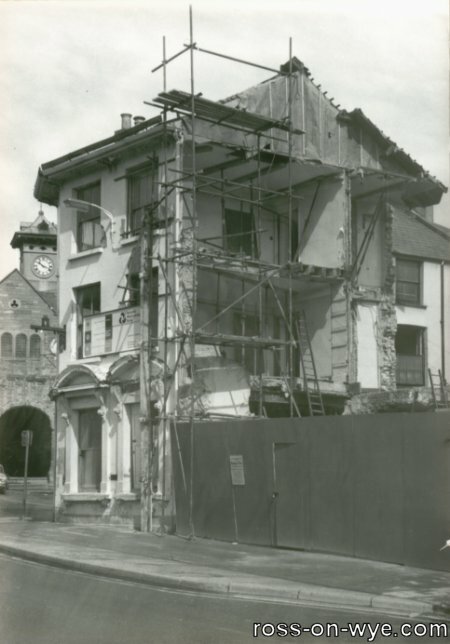 Further up are the Central Garage and Central Cycle Works. The signs hanging out from the Central Garage show that it stocked Clincher and Michelin Tyres. On the High Street can be seen Simpsons, Indea & China Tea Co.
On the right can be seen a cafe, a shop selling K-Boots and the sign for the Kings Arms. 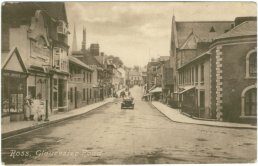 On the street on the left are a four people watching the photographer take the photo and in the centre is a policeman walking down the street towards the photographer. Outside the Central Garage can be seen a motorbike and sidecar which looks like there are two people working on it; one is crouched down near to the motorbike wheel and the other is leaning over the bike. In front of the Central Cycle Works is a pony harnessed to a trap that appears to be waiting for the driver to return and in front of the Kings Arms is a trap and no sign of the pony. 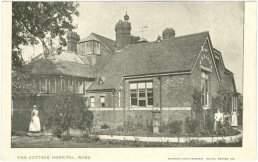 This is a postcard view of the Cottage Hospital that used to be on Gloucester Road before it was replaced by the Ross Community Hospital on Alton Street and retirement housing was built on the site.